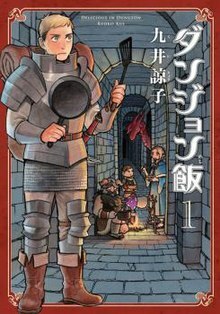 Delicious in Dungeon (Japanese: ダンジョン飯, Hepburn: Danjon Meshi, lit. "Dungeon Meal") is a Japanese fantasy comedy seinen manga series written and illustrated by Ryōko Kui [ja]. The series is published in Enterbrain's Harta magazine. Yen Press has licensed the series in North America. In a fantasy world of dungeon exploration, guilds go out on expeditions to raid dungeons, hoping to find the mysterious Golden Kingdom claimed to be the treasure of a certain island dungeon. The story starts with a failed mission, where six members of a team try to take on a dragon, but end up escaping at the cost of losing a member to the dragon’s stomach. After this, two team members leave to join another team, leaving only Laios (a human swordsman), Chilchuck (a halfling locksmith), and Marcille (an elven spellcaster) to grieve over Laios’ sister, Falin (a human spellcaster). Feeling indebted to their close teammate Falin, who used magic to teleport the team outside to safety, the remainder of the team brainstorms how to get back to the dungeon level with the dragon in time to save Falin from digestion. Much like AD&D, the team members must consider the cost of weapons, defense, recruitment fees for more team members, and food. With the majority of their supplies left behind in the dungeon, their mission seems impossible - until Laios suggests they sustain themselves by finding food inside the dungeon. (Laios has secretly wanted to eat dungeon monsters for a long time.) Chilchuck and Marcille are opposed to this plan, but Laios assures them by presenting a cookbook designed for it, and they head off. The first floor of the dungeon is filled with adventurers and is like a market, and this is where the team meets and joins Senshi, a dwarf who has 10 years of experience sustaining himself from the dungeon. The story then details their travels through the dungeon, the environments, traps, and monsters they encounter, and the meals they create. The pros and cons of these meals, characters' reactions to them, provide a running gag. A human knight who must venture deep into a dungeon to rescue his sister Falin before she is digested by the red dragon that defeated his party. Laios is a very strong fighter and the leader of the party. He is a very calm and gentle person who is excited to try different monster meals. He often uses the knowledge gained from cooking monsters to develop techniques to defeat them. He tends to speak very quickly when excited. An elven magician who fights with magic cast from a tall wooden staff. She is a cautious, mildly unconfident person who is usually hesitant and even sometimes unwilling to eat monster. She is an original member of Laios’ party. A halfling locksmith with good dexterity and keen senses. Chilchuck disables traps, finds hidden pathways, pickpockets, etc. for the group. He is a fairly calm and laid back person, but doesn’t like it when other people take over his job or take dangerous risks. He avoids combat as a rule but can use a bow and arrow. He is an original member of Laios’ party. A dwarf warrior who joins the party so he can fulfil his dream of cooking the red dragon Laios and his party have set out to kill. Senshi has an immense knowledge of the dungeon and the monsters within it, and is an expert chef. He typically fights with a large axe but always carries a pot and cooking utensils. He makes sure the party are well fed and have a balanced diet. A human spellcaster and Laios' sister, who was eaten by a red dragon at the bottom of the dungeon after using her magic to teleport the rest of the party to safety. Laios and his party are on a journey to rescue and revive her before the month-long digestion cycle of the dragon ends and she can no longer be resurrected. A mollusk monster from the 'living armor' monsters that now lives in the handle of Laios' sword. Ryōko Kui began publishing the series in Enterbrain's Harta magazine on February 15, 2014. North American publisher Yen Press announced their license to the series on October 28, 2016. 31. "Sea Serpent, Part 1"
32. "Sea Serpent, Part 2"
Bonus. "Miscellaneous Monster Tales -5-"
36. "Dried With Sweet Sake"
Bonus. "Miscellaneous Monster Tales -6-"
Volume 1 reached the 11th place on the weekly Oricon manga charts and it was the 87th best-selling manga volume in Japan from November 17, 2014 to May 17, 2015, with 315,298 copies sold. As of August 16, 2015, it had sold 381,614 copies. Volume 2 reached the 3rd place on the charts and, as of September 17, 2015, had sold 362,906 copies. As of August 2017, the first 4 volumes had over 2 million copies in print. The manga was chosen as the 13th best manga of 2015 in the Book of the Year manga ranking of Da Vinci magazine. The 2016 edition of the Kono Manga ga Sugoi! guidebook ranked the series at number one on its list of top 20 manga for male readers. ^ a b Stimson, Eric (January 19, 2015). "Learn How to Cook Classic Dungeon Monsters in New Manga". Anime News Network. Archived from the original on December 2, 2015. Retrieved December 12, 2015. ^ ハルタ 2014-FEBRUARY volume 11 [Harta volume 11, February 2014]. Enterbrain (in Japanese). Archived from the original on September 24, 2015. Retrieved December 12, 2015. ^ "Yen Press Adds Delicious in Dungeon & No Game No Life, Desu! Manga, your name. Manga & Novels". Anime News Network. October 29, 2016. Archived from the original on October 30, 2016. Retrieved October 29, 2016. ^ ダンジョン飯 1巻 [Dungeon Meshi volume 1]. Enterbrain (in Japanese). Archived from the original on December 10, 2015. Retrieved December 12, 2015. ^ "Delicious in Dungeon, Vol. 1". Hachette Book Group. Archived from the original on February 2, 2017. Retrieved January 23, 2017. ^ ダンジョン飯 2巻 [Dungeon Meshi volume 2]. Enterbrain (in Japanese). Archived from the original on December 10, 2015. Retrieved December 12, 2015. ^ "Delicious in Dungeon, Vol. 2". Hachette Book Group. Archived from the original on April 19, 2017. Retrieved April 18, 2017. ^ ダンジョン飯 3巻 [Dungeon Meshi volume 3]. Enterbrain (in Japanese). Archived from the original on August 15, 2016. Retrieved August 14, 2016. ^ "Delicious in Dungeon, Vol. 3". Yen Press. Retrieved November 23, 2017. ^ ダンジョン飯　４巻 [Dungeon Meshi volume 4]. Enterbrain (in Japanese). Archived from the original on February 2, 2017. Retrieved January 23, 2017. ^ "Delicious in Dungeon, Vol. 4". Yen Press. Retrieved November 23, 2017. ^ ダンジョン飯　5巻 [Dungeon Meshi volume 5]. Enterbrain (in Japanese). Archived from the original on January 23, 2018. Retrieved July 18, 2017. ^ "Delicious in Dungeon, Vol. 5". Yen Press. Retrieved March 6, 2018. ^ ダンジョン飯　６巻 [Dungeon Meshi volume 6]. Kadokawa Shoten (in Japanese). Retrieved August 5, 2018. ^ "Delicious in Dungeon, Vol. 6". Yen Press. Retrieved August 5, 2018. ^ "Japanese Comic Ranking, January 12–18". Anime News Network. January 21, 2015. Archived from the original on January 22, 2015. Retrieved December 6, 2015. ^ "Top-Selling Manga in Japan by Volume: 2015 (First Half)". Anime News Network. May 31, 2015. Archived from the original on December 4, 2015. Retrieved December 6, 2015. ^ a b "Japanese Comic Ranking, August 10–16". Anime News Network. August 19, 2015. Archived from the original on November 22, 2015. Retrieved December 6, 2015. ^ "Japanese Comic Ranking, September 7–13". Anime News Network. September 16, 2015. Archived from the original on November 20, 2015. Retrieved December 6, 2015. ^ "March comes in like a lion Tops Da Vinci Magazine's Rankings for 2015". Anime News Network. December 6, 2015. Archived from the original on December 7, 2015. Retrieved December 6, 2015. ^ "Kono Manga ga Sugoi! Reveals 2016's Series Ranking for Male Readers". Anime News Network. December 10, 2015. Archived from the original on December 11, 2015. Retrieved December 12, 2015. This page was last edited on 13 April 2019, at 17:39 (UTC).